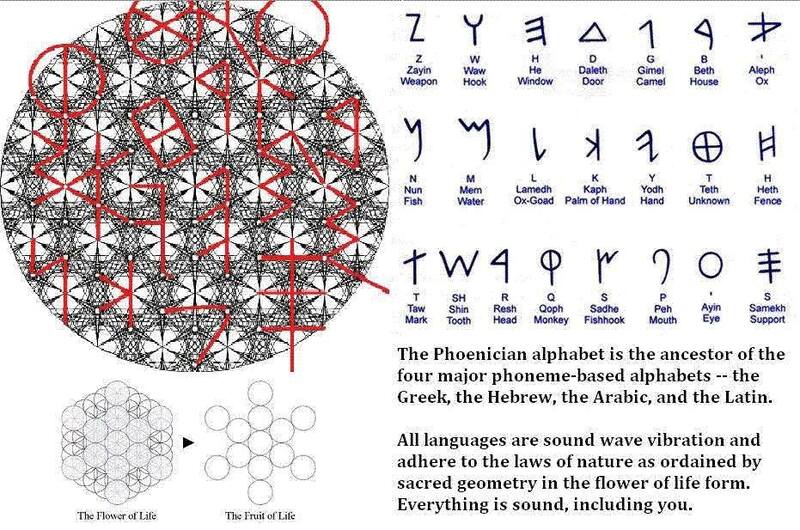 Linguistic languages and sacred geometry. Geneticists have discovered that human DNA undergoes an evolutionary jump by activating some junk DNA when a person is sending positive frequencies through positive affirmations in gratitude. All linguistic languages can be mapped from sacred geometry in the Flower of Life form that visually shows that language is vibration. The Flower of Life is believed by many metaphysical traditions to be the 1st completed energetic life form God created and then complex sound waves of sacred geometric shape such as Archangel Metatron’s icosahedron cube. Metatron’s cube has shown up unbiased in many ancient traditions and religions. It consists of all sacred geometry such as the Flower of Life, Seed of Life, tree of life, the golden ratio, the golden spiral, the golden mean, Phi, Fibonacci, tetrahedron, hexahedron, octahedron and the dodecahedron. Archangel Metatron is believed by many ancient civilizations to be the right hand being of God/universal consciousness in the creation process.The message mapped out in the form of conclusive math as depicted in sacred geometry is a infinite unbreakable truth in nature, which is that everything exists in unity, harmony, and oneness. If any living thing doesn’t realize this, then nature dismantles it and recreates new life forms that will work with the laws of nature. The words one chooses to say and hear sends a frequency that changes human DNA. There are 64 condones in dna. The waves of emotions cause condones to activate. We only activate two emotions. Fear and love have different sin waves. Fear is a shorter frequency, but unconditional love has a longer frequency that activates more genetic patterns in your body through activating more condones. That’s because the universe functions in simple math as seen in the number line we all learned in grade school and still trying to figure out in life . (+) + (-) = stability, nothing forward & nothing backwards. That’s why when you say or do a positive thing and then replace it a negative, you get in an emotional quagmire. (-) + (-) = -, which means two negative always goes into further descent. When you say or do something negative to yourself and follow with more negativity, you fall into more of an abyss. (+) + (+) = +, which means only two positives will amplify and grow as it feeds off each other in unison. This is seen when you do or say something positive to yourself, you feel good and it keeps on going. Here’s the kicker, your brain can’t tell the difference if you say or do something negative to yourself or to others as you brain sees you two as one being. So when you say or do something negative to others, your body still feels the effects of stress, anxiety, and paranoia as if you did it to yourself. A continuation of such negativity starts to create stress and ailments in your body. Living in unconditional love for yourself and others activates the Kundalini source energy within your pineal gland as displayed in a variety of 6th senses and shown in various spiritual artworks throughout the ages. The funnel torus that looks like a magnetic apple field around your heart is multiple torus’s insulated within more of itself and spinning in a circular pattern up to the top, around to the bottom, and back up again like a black hole. The infinity math is looping itself in the space between your dna strands on and on it goes. This is so because you are infinite energetic beings having a human experience. You are a hu-man be-ing., which means you are in the experience of “being” a “man” turning into a “Hu”, which “hu” means God or divinity. You are the integration of God or Goddess in man. A fully integrated human is enlightened and is a leading edge experience of the divine and the physical. So feed your divine energetic self positive, unconditionally loving frequencies in the form of loving words and thoughts. The long speculated 6th senses of human DNA can be activated based on the person’s level of spiritual consciousness according to science proving that long held mantras of healing or chanting as believe by Buddhists, Native Americans, Mayans, and many more ancient chanting traditions have been accurate. The question now is; what are you saying to yourself and others that’s either advancing or stunting your cellular evolution? The choice is yours. I cannot do the same for chillout because chillout tunes are a lot harder to find and are more rare when they are released. So stay tuned, part 2 of this segment will be uploaded tomorrow! and part 3 the day after. 3 days of pure trance, then 4 days after another chillout mix, then a week later back to Future of Trance & Progressive EP 011 with part 1 and a day after part 2 and so on and so forth. If you have any questions or suggestions please leave a comment below! Also please note I have created a backup account incase I lose this one, it can be found here http://www.youtube.com/ivorytrance and subscribe if you wish. Please do not forget the previous episodes of this series in that I will not reupload tunes I played before, and trust me a lot of them are worth listening to! Note that the first song in this video is my tune of the week! Thanks folks speak to you tomorrow for part 2! Also, check out the thumbnail it spat out…a mixture of pics 2 and 3…looks amazing! The fifth dimension of existence where time is no longer perceived as linear but is circular – therefore does not exist. Since time is known to have a beginning and an end.